President Paul Biya needs to stop further provocative actions and illegal administration of the territory of the Federal Republic of Ambazonia. On 5 January 2018, the Government of la Republique du Cameroun and Nigeria illegally adopted His Excellency Sisiku AyukTabe, President of the Interim Government of Ambazonia-in-exile, plus 9 top cabinet members in Abuja and rendition them to Yaoundé where they remained incommunicado for over 10 months until recently with deteriorating health conditions. Prior to their arrest and rendition, on 30 November 2017, President Biya declared war against the Federal Republique of Ambazonia. During the intervening one year, soldiers, gendarmes and police loyal to President Biya have deliberately killed over 10,000 unarmed civilians, within the internationally recognized territory of Ambazonia. In addition, at least 10,000 college and university students including their lecturers have been illegally arrested and are currently tortured in deplorable prison conditions and underground secret chambers across the territory of LRC. Over 2000 Ambazonians are now maimed; scores of disabled seniors have been roasted to ashes in their homes, and tens publicly beheaded by LRC soldiers as a war tactic to scare Ambazonia to submission. In addition, over 500,000 citizens of Ambazonia are internally displaced. On top of that, close to 200,000 Ambazonians, especially mothers and girls have escaped to Nigeria for refuge. More so, at least 1000 homes have been burnt to ashes in some 140 villages across Ambazonia. The signing of a decree creating NDDRC on the same day that the CAF Executive Committee, which met in Accra, withdrew the hosting of African Cup of Nations (AFCON) from la Republique du Cameroun further undermines international call for La Republique and Ambazonia to negotiate political settlement to end the war. The decree further makes a mockery of the international organizations including the AU, the UN and the EU, foreign governments including the US, the UK, Germany and France; and other interested parties like Amnesty International and International Crisis Group that have urged President Biya to release all those in arrested related to the war, demilitarize Ambazonia and negotiate a lasting solution with the Interim Government of Ambazonia based on the boundaries inherited at independence. Yet it is no surprise that this Committee is created in the middle of a war and without consultation with the Interim Government of Ambazonia and the conditions are not ripe. While the citizens of LRC may be bound by this decree, the extension of the decree to cover Ambazonia violates our territorial integrity, which is further war. We know the spirit of the text and intention behind the decree. The decree is a two-faced machination of the government to pretend they are working to enforce peace and security while in fact they mean evil and this is well known to Ambazonians. The decree is a renewed effort by the Biya regime and its agents and ministries to stage a Disarmament, Demobilization and Reintegration (DDR) process using fake the “Amba boys of Minister Atanga Nji” who have been terrorizing Ambazonia citizens, conducting kidnappings and requesting ransoms as a means of deceiving the international community that our restoration forces are terrorist. And finally, the Biya regime hopes that if successful to film their fake Amba Boys dropping den guns and confessing verbally, they can deceive both the citizens of Ambazonia and the global community that the war is over; thus, finally nailing the coffin of the “Ambazonia Liberation War” once and for all. We want to unequivocally state for the umpteenth times that the decree NDDRC and any action coming from it is baseless and inconsequential. Our President, H.E. Sisiku AyukTabe has categorically said times without numbers that we are out to restore our independence and not to destroy a country or bring pain on our citizens. He said anytime you hear a gunshot, and it is said to be coming from our restoration forces, you should know that it is fake as we do not use weapons or violent tactics against our citizens to achieve our goals. We have one enemy, LRC government military, gendarmes, police and her appointed administrators in our territory. By this evil design, the restoration of the independence of Ambazonia sovereignty now gaining momentum, will be done away with finally. This is a multi-faceted scheme with involvement of agents at various levels and layers. 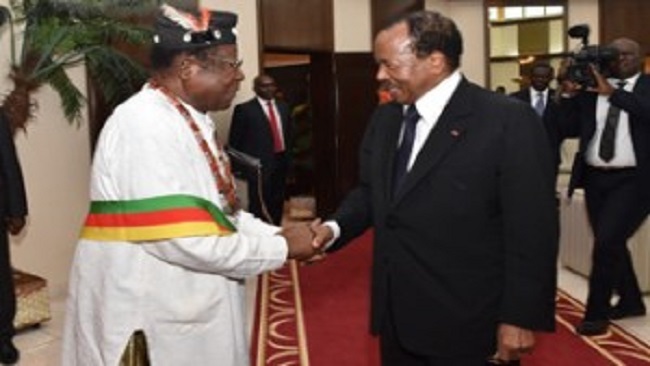 Recently, the Biya government gave usual false hope promises about, inter alia, humanitarian support, road construction projects and construction of burnt homes as an indication of executive authority over the territory of Ambazonia, when he knows fully well, that the Ambazonia Liberation War has long crossed the red lines for federation and decentralization. By now, the Biya regime must know that the Ambazonia Liberation War crossed the orbit of negative return for the quest of sovereignty when Ambazonians shed the blood of freedom on Ambazonia soil. The Commander-in-Chief of Ambazonia Restoration Forces H.E. Sisiku AyukTabe said sovereignty of Ambazonia is nonnegotiable. 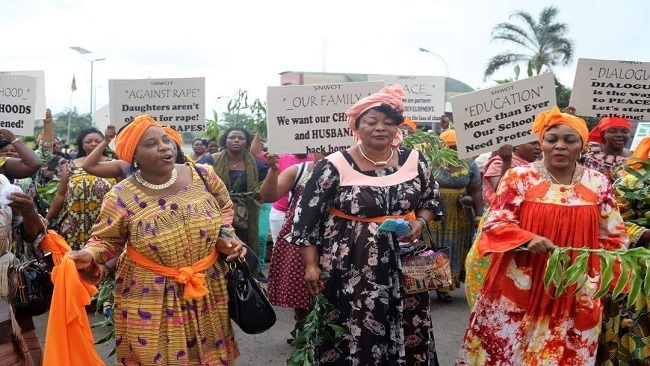 For two years now, especially since January 2018, we have been staging peaceful protest marches and sit-in home strikes to press across the globe our demand for the freedom of our revered President Sisiku AyukTabe, nine members of his cabinet and scores of others in detention since the crisis started in late 2016 and morphed into a war in November 2017. We have not for once resorted to the use of terror tactics. This is not about to change. We therefore reject any form of violence or use of terror tactics in our name. The bait here is to initiate some very alarming disruption of public peace and terrorization of Ambazonia citizens and residents in the name of the “Amba Boys,” LRC sponsored criminal gangs and armed merchants, in order to reach their goals. This evil design of linguistic and foreigner cleansing in our name is plotted to be of a magnitude and proportions as to sufficiently frighten the public and international community so that they will avoid anything about Restoration Forces like ebola plague. In the thinking of the Biya regime, such inhumane and barbaric actions like the Pinyin and Bali massacre will swing public opinion against us and push Ambazonia citizens into another half a century of slavery and servitude under the dominant French Cameroun government. The plots by the security forces have thickened to carry out series of attacks of such a large scale and proportions similar to the dreaded terrorist group Boko Haram, starting from the course of our peaceful activities using their agents within. In that way, the Biya regime hope to associate the self-defence to protect our citizens and their property with violence, and from there, the security forces will take it from there and escalate it to the scale and scope they desire. In conclusion, the Ambazonia Restoration Forces is not and should not be held responsible for any breech of peace or violence that will result from any false-flag plots. We will continue to employ all lawful, legal, defence and constitutional means as we have done throughout these two years of LRC-perpetrated terrorist activities to achieve our goals and would neither be coerced nor blackmailed into submission or surrender. Our escalating and timely self-defense activities will continue as planned and in our ways without fear of intimidation. Rather than take risk to conduct any activity in Ambazonia that will only escalate the war and thereby further shed innocent blood, the Ambazonia Self-Defence Council and Interim Government urge any person, who so ever and especially from the Biya regime, to stay clear Ambazonia territory until such time when conditions become conducive to visit or conduct business. Ambazonia vehemently rejects President Biya decree creating the “National Disarmament, Demobilization and Reintegration Committee;” our Restoration Forces remain on hair trigger alert and continue to defend our citizens and homeland against any illegal occupation and foreign invasion.